Two needlecases that I have made…over thirty years apart! The yellow needlecase on the left was made by me in 2007. 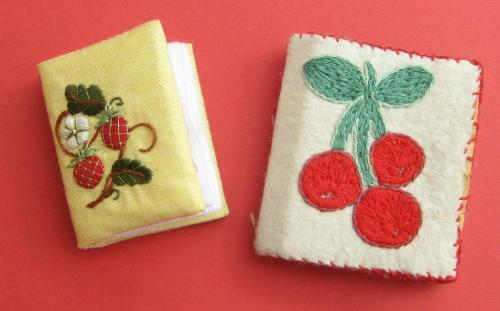 The one with cherries on the front, on the right, was made by me in 1974, when I was twelve. I only made the yellow one because the original one was falling apart, but I still love the old one. 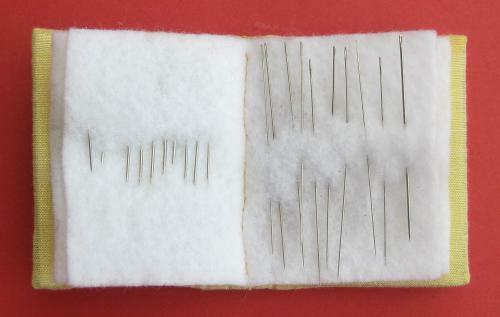 I keep it full of needles, still – I couldn’t face emptying it – so I go to it occasionally, when I know that a ‘special’ needle will be found there, and not in my new needlecase. 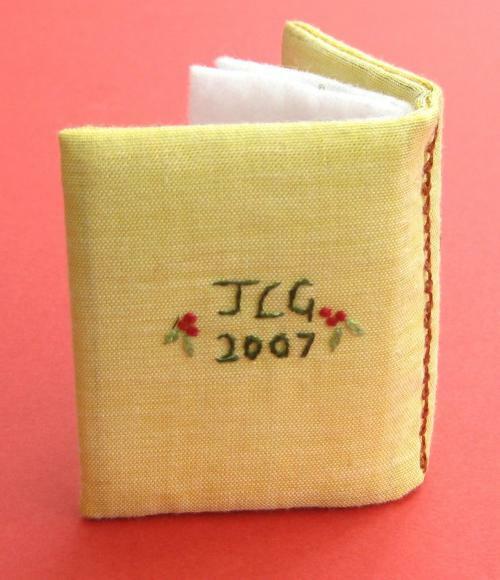 I made the yellow needlecase in 2007 (33 years after the first one – by that time, I was 45!). The motif on the front of the yellow needlecase was transferred using a light box, and then stitched in Anchor threads and gold blending filament. 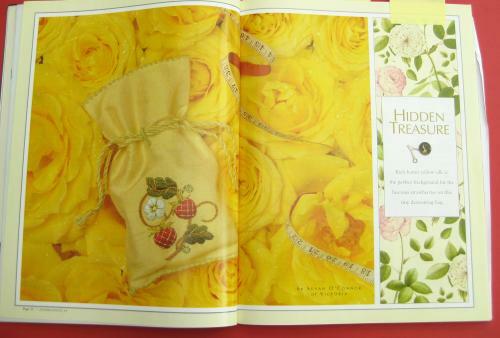 The design was from Issue 44 of Inspirations magazine. 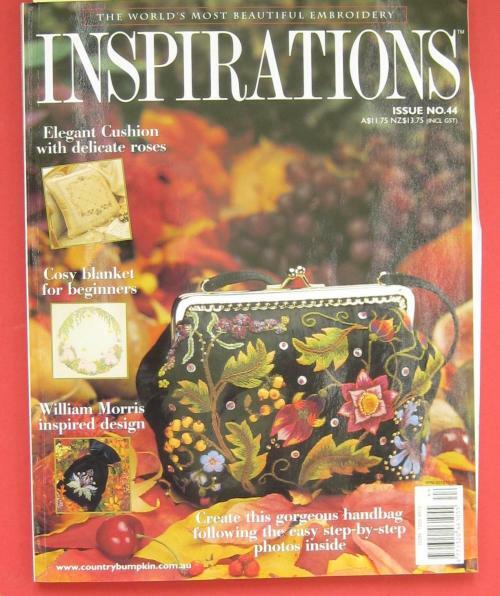 The pattern for the needlecase itself was from Jane Nicholas’s wonderful book ‘Stumpwork Embroidery: Designs and Projects’, published in 1998 by Milner. The design she chose for the front of her needlecase is a beautiful little squirrel – he’s very tempting, but at the time I really wanted a yellow fabric for my needlecase, and I decided the colour of the squirrel’s fur would clash with the fabric. So, the cute squirrel with his gorgeous fluffy tail will have to be stitched another time. 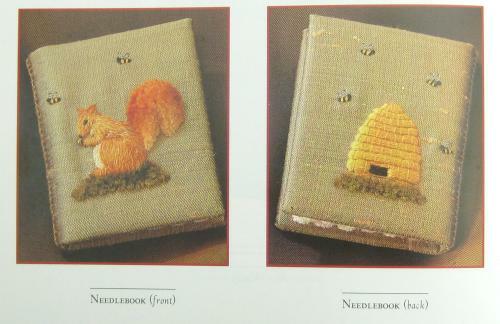 The pages of the yellow needlecase are white felt – one page each for crewel needles, beading needles, etc. 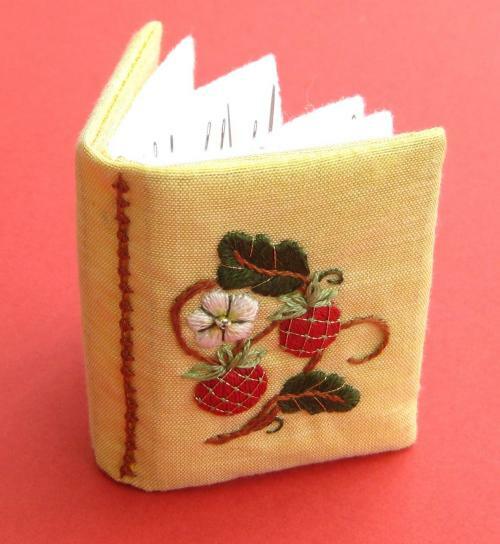 The pages were backstitched to the cover along the central spine, and then the functional backstitch disguised on the outside of the cover by stitching a row of coral stitch over the top. It’s come out well enough….but I think I like my needlecase with the cherries the best! Author Janet GrangerPosted on June 7, 2012 May 31, 2012 Categories Needlecases - old and new, Surface stitcheryTags Crafts, Embroidered needlecase, Embroidery, Finished embroidery, Hand embroidery, Needlecase, Surface embroidery6 Comments on Two needlecases that I have made…over thirty years apart!